This project, undertaken by the AMOSSHE East regional group, aims to review the types of service-use data collected and how this is used, in order to map the categories recorded and identify similarities and differences between AMOSSHE member institutions in the eastern region. Principal investigator: Rachel Fletcher, Director of Student Support at the University of Essex. Total award from AMOSSHE: £4,950. The AMOSSHE East group consists of Anglia Ruskin University, Norwich University of the Arts, University of Cambridge, University Campus Suffolk, University of East Anglia, University of Essex and University of Hertfordshire. The eastern regional AMOSSHE group has been meeting regularly since June 2006 and is a small group of AMOSSHE lead members. As well as providing peer support, professional development and discussion for members in the region, AMOSSHE East has also facilitated a regional disability managers group and held an inaugural regional staff conference for student services managers across the region in June 2013. AMOSSHE East has a broad mix of institutions in active membership from ancient (University of Cambridge, established 1209) to new (University Campus Suffolk, established 2007). There are two large (Hertfordshire and Anglia Ruskin) and two smaller universities (UEA and Essex) and one specialist institution (Norwich University of the Arts). The region has the current holders of the Times Higher Education awards for Outstanding Student Services Team (ARU) and for Outstanding Support for Students (Essex) and Number 1 for the Times Higher Education Student Experience Survey (UEA). 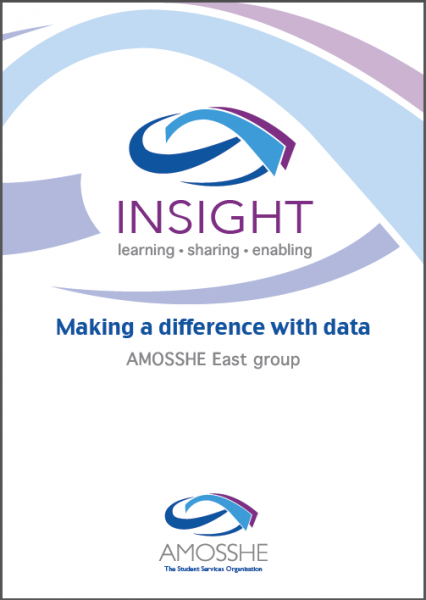 AMOSSHE East are well placed to identify improvements to service-use data for wider dissemination across the sector. From discussions with other AMOSSHE colleagues, the group believes that this is a sector-wide issue, and they are not aware of previous work in the area. This project will explore an under-researched issue within student services. The project will build on Value & Impact methodologies (for example, providing categories for inclusion in a toolkit) and aims to generate best practice guidance for further national dissemination. All student services teams collect data on the use of their services by students, but this is generally locally determined and disseminated. The aim of this project is to review the types of service-use data collected and how this is used, to map the categories recorded and to identify similarities and differences between AMOSSHE member institutions in the eastern region. The project will review how each institution uses its data internally and consider whether there are opportunities to compare and contrast between services at different institutions; including making suggestions for common measures or categorisation for the future across all participating institutions' services. There is potential for the findings to build on AMOSSHE Value & Impact activities and to inform changes to the AMOSSHE benchmarking survey to report on levels of service-use (as well as scope of provision) in future. The project will include services overseen by AMOSSHE lead members in the eastern region. As the breadth of roles varies between institutions, the project will focus particularly on services provided by all, or most, of the participating institutions (for example counselling / wellbeing, disability, information advice and guidance). Identify what existing data is collected across the various services on student use, including how it is categorised. Map this between services (to identify common areas and differences). Review how summary and management data is disseminated within institutions. Identify whether comparisons can be made from data held (for example, proportion of students engaging with student support services). Make recommendations for changes to data collection or categorisation for inclusion in a Value & Impact toolkit or future AMOSSHE benchmarking surveys. A report with findings and recommendations. Suggestions for categorisation of student enquiries to improve collation and benchmarking between higher education providers. Conference sessions at a regional AMOSSHE conference and the national AMOSSHE conference. Findings and materials will be available to AMOSSHE for further dissemination.